With attacks becoming increasingly sophisticated and widespread, mid-market organizations find themselves in need of enterprise-level protection without the same burden of complexity. Endpoint security is an increasingly important issue for companies of all sizes. It’s also a sector of the security market in a constant state of flux. Not only are vendors expected to keep pace with ongoing advances in attack techniques, they’re also engaged in a race to take advantage of emerging technologies. While traditional antivirus (AV) solutions are still very much part of the mix for many organizations, there has been a definitive shift toward more contemporary, “next-gen” solutions that are better suited to handle modern, increasingly sophisticated threats. 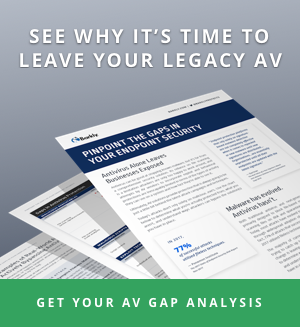 The challenge for small and mid-market companies is finding an endpoint solution that levels up their protection without overwhelming their IT teams with difficult-to-manage features and overhead. They essentially want the strength of enterprise-level security without all the complexity. 451 Research, an information technology research and advisory company, has spent a lot of time studying the endpoint security market. In December, they released their Endpoint Security Market Map 2017 report, which analyzed almost 100 endpoint security vendors and the market as a whole, with a focus on enterprise-level organizations. In this report, they identified several key trends driving big changes in the market. In this post, we’re going to talk about how those trends apply to small and mid-market companies. While many large organizations still take a more siloed approach to endpoint security — using different, specialized products for the tasks of prevention, detection, and response — there is a growing trend to instead implement a single, “all-in-one” solution that enables centralized management of multiple security functions. It’s no longer a question of choosing between strong protection designed to prevent attacks or building out capabilities to more effectively detect and respond to inevitable compromises. Today, companies want endpoint security defenses that combine each of these aspects into one, holistic solution. Like their enterprise counterparts, small and mid-market companies want an endpoint solution that provides a full range of capabilities. The key difference is that, for smaller companies, more also often requires more staff, resources, and expertise they don't necessarily have. That puts a lot of emphasis on the value of simpler, more automated workflows that are easier to implement and manage. Based on this, mid-market companies tend to look for solutions that offer wide protection against both traditional and more advanced types of attacks. They also want something that will either integrate with or replace an existing AV product. Flexibility is key. For the most part, mid-market companies prioritize preventive actions over sophisticated forensic investigation features. Enterprise-level companies with dedicated security operations centers (SOCs) are more likely to have the human resources to apply to intensive post-attack research. For mid-market companies, the primary goal is eliminating the threat fast and moving on to the next task. Developed specifically for mid-market organizations, Barkly's Endpoint Protection Platform is purposefully designed to deliver the strongest protection alongside powerful simplicity and ease of use. As a result, it makes IT and security pros more confident knowing a) their companies are protected from the latest threats; b) Barkly provides them with the ability to contain, investigate, and respond to incidents using automation to create workflows that are less time intensive and less technically demanding. Endpoint isolation: Remotely cut off network access to any specific endpoints while you investigate incidents. Automatic quarantine: Once a malicious program or process has been blocked, prevent end users from tampering with it or making further attempts to run it. Reported user feedback: Automatically gather information from end users such as what they were doing when they received notification an attack had been blocked. Incident path visualization: Conduct basic root cause analysis by tracing the path of a malicious process back to its origins. Efficiency is a goal for all IT professionals, no matter the company size. Even large companies with extensive IT security teams know that time is money. The pursuit of efficiency is driving enterprise-level security solutions to develop features such as simplified user experiences for SOC teams and the ability to perform natural language queries. Limiting or eliminating back-end infrastructure: A growing number of mid-market companies are opting for solutions that don’t require the installation or management of on-site components or the hassle of messing with local servers. Cloud-based solutions offer a high degree of resilience as well as an opportunity to greatly simplify infrastructure. Centralized management: Because most mid-market companies have limited security staff, it’s very important that a solution offers centralized management and a user-friendly interface designed for speed and remote use. For example, the ability to handle network issues via mobile devices can help one admin be in two places at once. Mid-market organizations also want to make sure any security solution will have low impact on operations and performance. The Barkly CommandIQTM Management Portal, which makes protection alerts, insights, and actions accessible anytime from anywhere via any desktop or mobile device. Intelligent automation that simplifies complex workflows, making advanced protection more accessible, even if you don’t have in-depth security expertise. As hackers stock their arsenals with increasingly powerful tools and evasive techniques, many vendors have turned to machine learning as a way of leveling the playing field and keeping pace on multiple fronts. Enterprises have been quick to see the value of machine learning models in detecting malicious files, for example, but many are investigating additional uses. Automating basic security tasks and enhancing their SOC team's work around threat hunting and threat intelligence are just two examples. For companies without SOC teams, the primary application of machine learning is to strengthen endpoint protection by stopping malware that may otherwise slip by undetected. In this regard, they have as much to gain from machine-learning-powered protection as enterprises, but considering market saturation, they may also have more difficulty differentiating between all the solutions that claim to offer it. The challenge is discerning the actual value beyond the buzzword, and the simple (best) way to do that is by conducting thorough testing to validate whether it can stop more malware without raising false positives. Period. Barkly takes a unique, "responsive" approach to harnessing machine learning that helps it block more threats with greater accuracy. First, it gathers samples and retrains its models far more regularly than other vendors (on a nightly basis). This allows Barkly's protection to evolve and continuously remain one step ahead of the latest threats. In addition, Barkly's responsive approach takes into account each organization's unique software environment, allowing Barkly to create highly customized variations of its protection models specifically tailored to each one. The result is a dramatic reduction of false positives that frees admins from the burden of managing whitelists and/or hosts of exceptions. In their 2017 Endpoint Security Market Map, 451 Research says that, “The future points to increased pressure on vendors to maintain a high degree of functionality while reducing the drag of complex operational requirements.” In other words, IT professionals need a tool that gets the job done without requiring heavy lifting during implementation or ongoing management. For mid-market IT and security teams, in particular, that tool should provide them with flexibility and ease of use that simplifies their day-to-day work instead of making it more complicated. That’s exactly the kind of tool we've built at Barkly. You can learn more about Barkly's Endpoint Protection on our product page, or, if you'd like to see it in action for yourself, sign up to see a demo. Evaluating endpoint security and considering your next move? Don't make a decision without reading this guide first.